Looking to transform your garden or yard with a great new look? 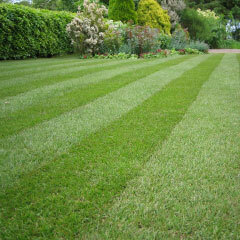 Love the natural feel of an open lawn, but don't have the time or land to support a seeded lawn? Turf could be the answer. Ricky Tyler Landscapes offers a fantastic landscape gardening service for homes in across Hertfordshire and surrounding counties, and as part of our service, we create gorgeous turfed lawns for private and commercial properties. A green, spacious lawn adds style and value to your property, and is perfect for entertaining friends, letting the little ones play on, or just admiring the view. Even smaller properties that don't currently have gardens can benefit from turfing, as it creates a sustainable surface which looks natural and can withstand a lot of wear and tear. We can also create seeded lawns if you're looking to start from scratch, or we can help make an old patchy lawn look new and well again with some TLC. Grass grown from seed will last longer and be tougher, so it's a great choice for anyone looking to create a permanent garden. Whether you prefer the look and feel of a natural lawn or the convenience of turfing, you can count on Ricky Tyler Landscapes to create a great result. Our residential turfing service offers amazing value, and with a trusted and respected team on the job, you know you'll get the right result! What's more, we guarantee to beat any genuine quote, and we provide a full aftercare service to keep your garden looking great year after year. Need a hand keeping your new lawn in check? From mowing to weeding, our garden maintenance team offer regular visits and a thorough gardening service. If you'd like to know more, or to arrange an appointment, call Ricky Tyler Landscapes today.